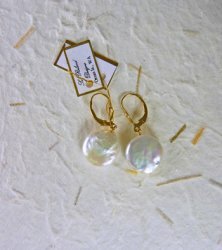 Fresh Water Pearl Earrgins by Sue Roland. Sue has chosen disc shaped pearls for this set of earrings. Each disc is about 5/8" across. The clasp and findings are 14K Gold Filled.